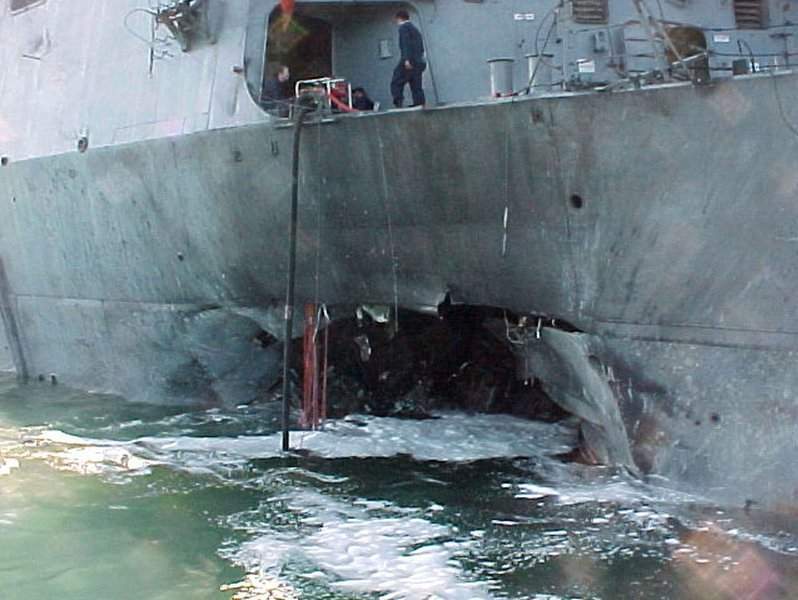 Associated Press The U.S. Navy released this view of damage sustained on the port side of the destroyer USS Cole after a terrorist bomb exploded during a refueling operation in the port of Aden, Yemen, on Oct. 12, 2000. Seventeen people were killed. Photo courtesy of Bill Schabacker Runners approach the mile marker of USMC Lance Cpl. Andrew F. Whitacre in Bryant in the 2016 Indiana Run for the Fallen. This year's event will span the nation and honor the fallen in chronological order. Whitacre, who died in Afghanistan on June 19, 2008, will be honored in Kansas. Associated Press A large white tent covers the hole on the side of the USS Cole in Aden on Oct. 13, 2000. 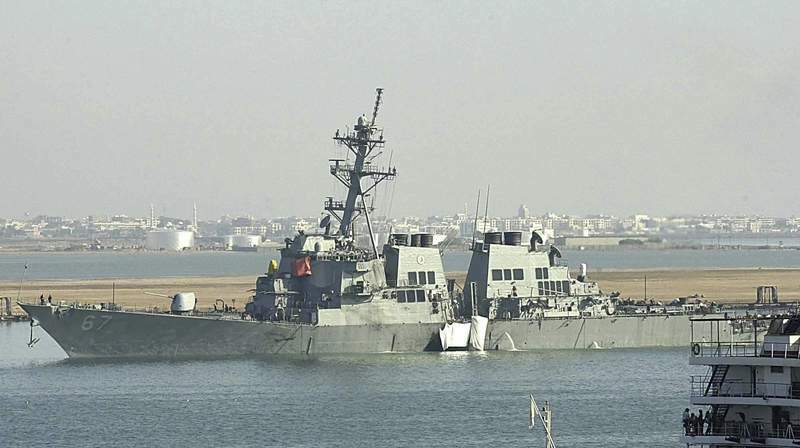 A powerful explosion ripped a hole in the U.S. Navy destroyer in what U.S. officials descri bed as a possible terrorist attack. 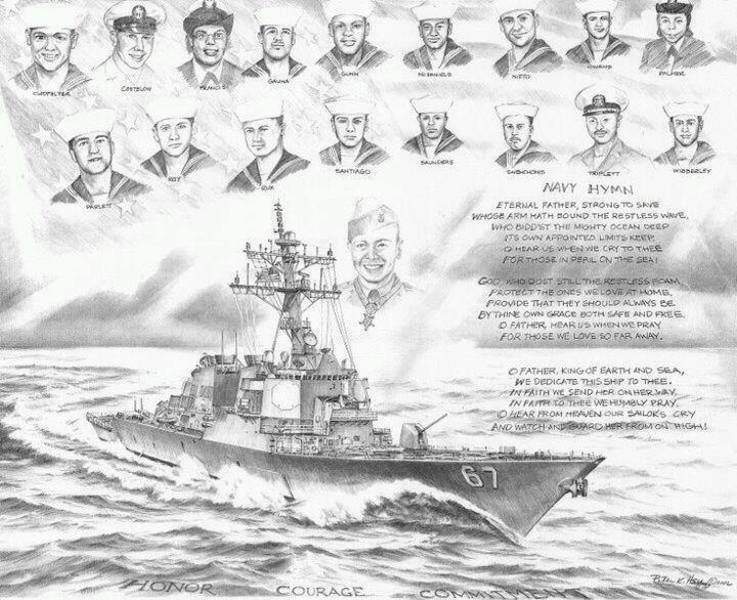 Courtesy Cliff Moser has this pencil drawing of the USS Cole and the 17 crewmembers lost in the Oct. 12, 2000 bombing of the ship in Aden, Yemen. He intends to take the framed picture wherever he goes for America's Run For the Fallen to put faces with the fallen. America's Run for the Fallen commemorates many things for veterans and civilians. This year's event, which begins in Fort Irwin, California, on Saturday, ensures the memory of the nearly 20,000 armed forces members who have fallen in the current War on Terror since Oct. 12, 2000 will never fade. The event will span 19 states with runners stopping at every mile mark to commemorate individuals or a group of servicemen and women that were killed. At each stop, the memorials will state the fallen's name, rank and hometown. The commemorations will go in chronological order of death beginning with those lost on the USS Cole. 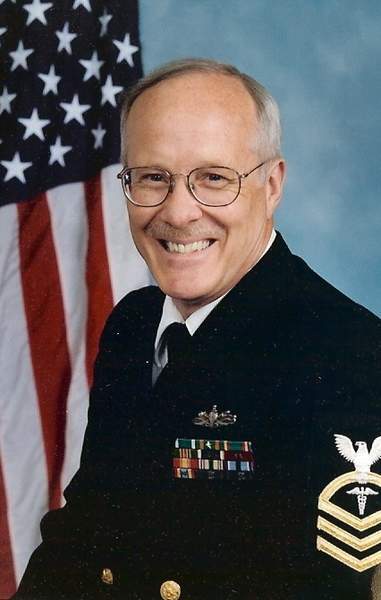 Moser, 67, of Portland, was aboard the USS Cole, a guided-missile destroyer, on Oct. 12, 2000 when a bomb exploded killing 17 while the ship was refueling in the harbor in Aden, Yemen. The morning of Oct. 12 began like any other. When the ship arrived in the port of Aden, Moser went about his duties of ensuring the water was being treated to be used on board. He remembers the ship was refueling and then seeing a small boat off to the side before he headed downstairs to deliver the results of the water. As a man of routine, around 11 a.m., he headed to the chief's mess hall for lunch with intent to take his usual afternoon nap afterward. “I knew in my mind that it was the spirit of God that was speaking to my soul and I went ahead and I took another bite of my chicken fajita. That voice stronger, more urgent, said, 'Cliff, leave. Leave now.' So I got up, I didn't know what was going to happen, I didn't know if there was going to be an argument. I knew one thing: that spirit speaking to my soul told me to leave the chief's mess. Not more than 10 seconds after Moser's departure from the chief's mess, the explosion occurred. Everything was dark, everything was quiet. Being the ship's equivalent to a medical professional, Moser immediately began asking himself the questions of extent of potential injuries. The first person he came across that required help was a fellow chief who had suffered a leg wound. At that point, Moser was still unsure what had happened. For the following hour and 39 minutes, the casualties were assessed. The injured were treated by their shipmates, Moser triaged and the deceased were put in body bags. The injured and deceased had to be carried off the ship onto the refueling platform in the water. It was a half-mile to land. Of the 39 injured in the explosion, one later succumbed to his injuries bringing the fatalities to 17. Moser said it took almost a week to retrieve all the fatalities from the ship as many levels of the craft were inaccessible due to the damage from the explosion. The route of America's Run for the Fallen will span from Fort Irwin to Arlington National Cemetery in Virginia, where it ends on Aug. 5. Until this year, the annual Run for the Fallen events have been organized at state levels. Indiana's began three years ago with the relay-type running route spanning Fort Wayne to Indianapolis with stops in Portland and Anderson. Moser, his wife Jo, her sister Carol Schabacker and husband Bill, will be traveling to California to honor those who served alongside Moser. Moser isn't a runner but may walk the final half- or quarter-mile in California. The family has been involved with Indiana's Run for the Fallen the past few years. Moser's nephew (Jo's brother's son) U.S. Marine Corps Lance Cpl. Andrew F. Whitacre was killed in Afghanistan on June 19, 2008, and has been honored by the run in Bryant, north of Portland. The family has stood by the mile marker with Whitacre's name and has served catered meals to the runners when they stop over for the night in Portland. “I've been at the stopping point at Bryant with my wife and also that evening when the runners and some of the Gold Star families,” Bill Schabacker said. “They had a dinner in Portland at the American Legion, and I've helped to serve the food and the families. 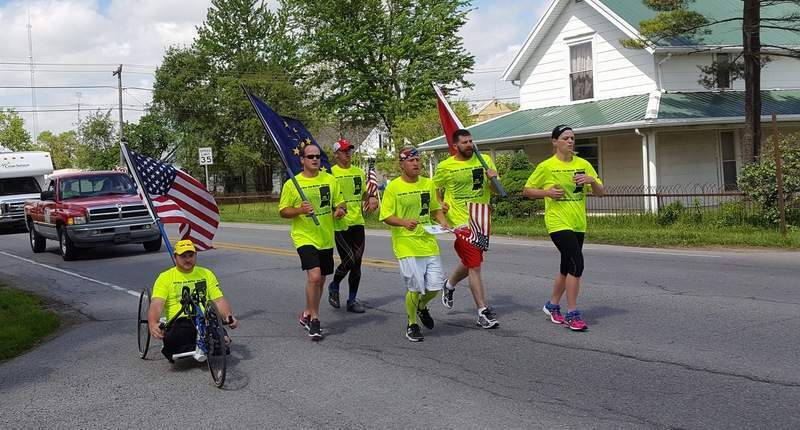 Fort Wayne's Frank Murphy, whose father was in the U.S. Air Force, has participated in the running portion in Indiana the last three years and will do so again this year when the route is in Indiana on June 20-30. Murphy is a distance runner and provides a different sort of guidance for those who aren't quite as trained in how to approach anywhere from 12 to 24 miles of running. For those interested in becoming involved with the Run for the Fallen, go to RunfortheFallen.org.